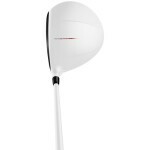 The TaylorMade AeroBurner hybrid is aimed at any golfer looking for more forgiveness and more ball speed, even on slight mis-hits. This is achieved by the AeroBurner’s aerodynamic design, large Speed Pocket and shallow face. The Speed Pocket increases the size of the sweet spot, reduces spin and generates face flex giving more power and distance. Engineered for the intermediate/Advanced golfer, this stainless steel head and Matrix Speed RUL-Z 70 Graphite Shaft club is the perfect hybrid option for the golfer seeking added distance and mid-high launch. The TaylorMade AeroBurner Hybrid has the latest aerodynamically engineered shape with a shallow face and an eye-catching new hosel fin that reduces drag and increases club-head speed. 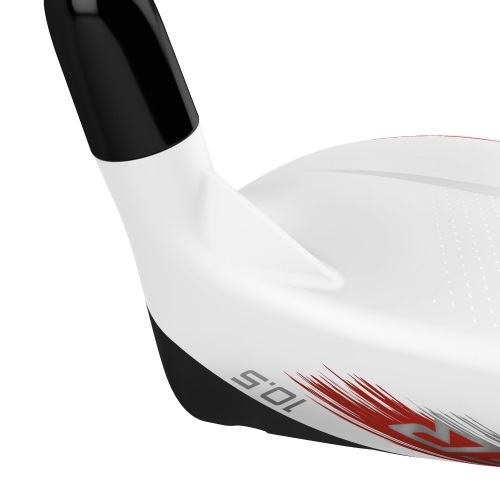 Golfers at all levels will gain increased confidence in their swing with this hybrid. The raised, dimpled and bright white head with a contrasting black PVD face can be distracting, but the raised stripe in centre of the crown and the linear AeroBurner graphic alignment aid do help to square up the club. 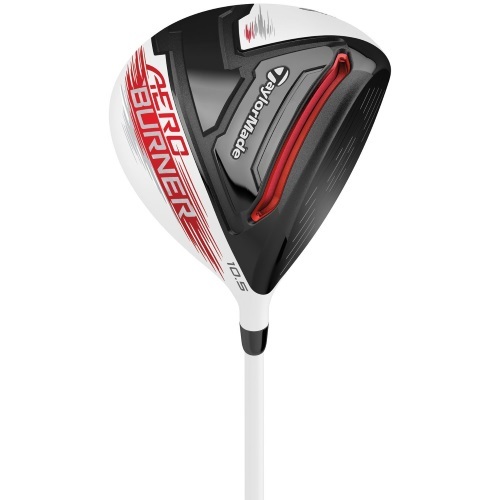 Though it’s only about 15 cc bigger than the R15 hybrid, the TaylorMade Aeroburner hybrid looks much larger. It’s fairly bulky from front to back, giving it an appearance a little more like a fairway wood. The lightweight Matrix Speed RUL-Z 70 shaft feels good and gives more controlled distance and stability. The shaft has the Taylormade branding for instant brand recognition. TaylorMade engineers have added a striking red “Speed Pocket” on the sole that increases flex on the face for added distance. This also comes with a flexible debris cover to ensure no mud or grass gets trapped inside. 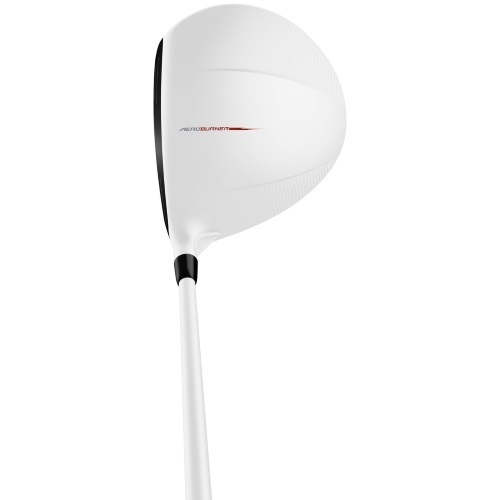 TaylorMade have designed a hybrid that feels solid. It makes an explosive crack at impact. A centre strike offers a soft, dense compression and when you miss the sweet spot it offers a gentle nudge. At impact, the feel is between firm and hard. At times, the hybrid gives the feeling that the ball is jumping off the face, a good sensation. Though the mid-weight shaft weighs only 70 grams, the Aeroburner hybrid feels very light everywhere except the head. If you prefer a higher swing weight, you’ll like this hybrid, otherwise you may find the unbalanced, head-heavy feel a little disconcerting. The AeroBurner hybrid provides above-average distance, a mid-high launch that is easy enough to elevate, with a moderate spin. The AeroBurner is a dynamo off the tee, strong in the fairway and above average from the rough. The hybrid covers up small mis-hits, but will let you know when you’ve missed a shot significantly. The AeroBurner hybrid has a nice and high penetrating flight that carries well. This version has a bit more draw bias, which will help those that need it. The updated speed pocket improves output on off-centre contact. The AeroBurner offers no adjustability so is best suited for players who want to stand up to the ball and let it fly. The TaylorMade Aeroburner is a hybrid that’s built for distance. The aerodynamic design, improved Speed Pocket, and a shallow face provides high ball speed across the face. Even if you want to keep your 4 and 5 irons in the bag, the AeroBurner may give you the chance to hit shots you might never have considered before.